Each athlete, no matter the sport, has a unique body type and composition. Understanding her/his distribution of mass, i.e. where fat and muscle are stored, helps to understand the response to different training and nutrition plans. Changes in weight can cause differing changes in the type and distribution of fat and muscle storage. We have shown previously in male athletes how increasing weight is associated with a higher proportion of fat to be accumulated relative to lean muscle mass. 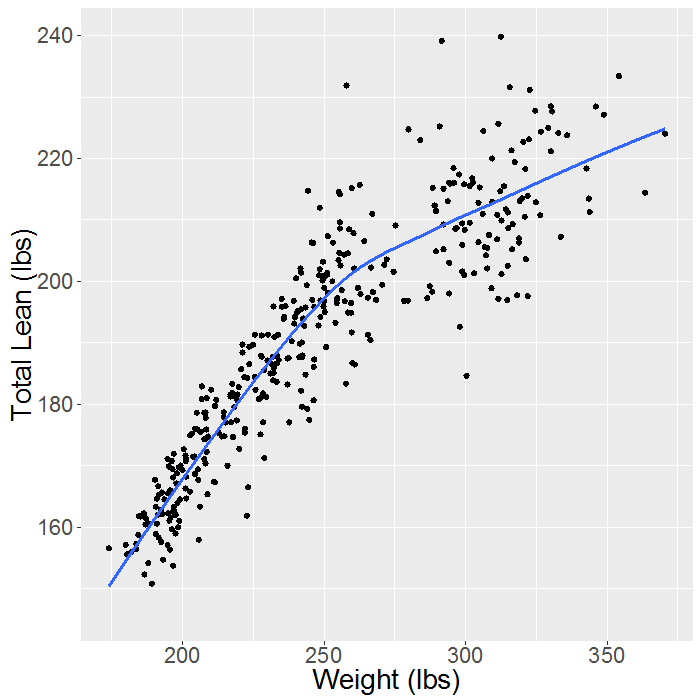 The first figure shows a steeper increase in fat above 250 pounds, where the second figures shows a plateau of lean muscle mass at that same threshold. 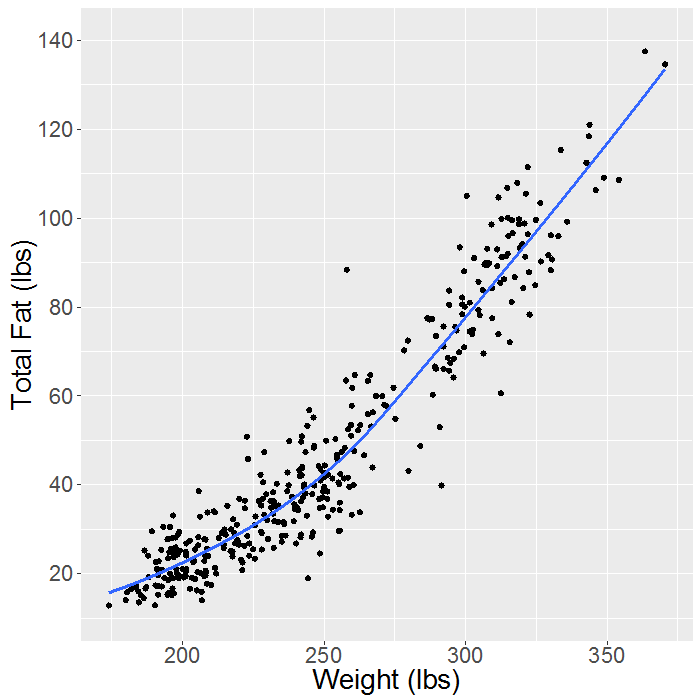 Taken together, these data suggest that male athletes will start storing more fat above 250 pounds. 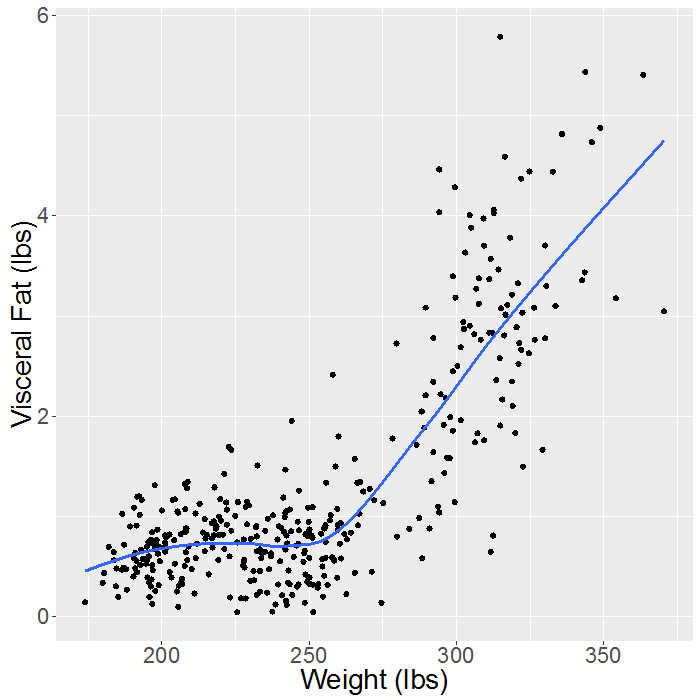 More importantly, though, we see in figure 3 a sharp increase in visceral fat at this same threshold. Visceral fat is the fat that surrounds our organs and is associated with metabolic complications. Visceral fat storage suggests that the body has met the storage capacity limits of subcutaneous storage sites. These changes are observed during a playing season as well. 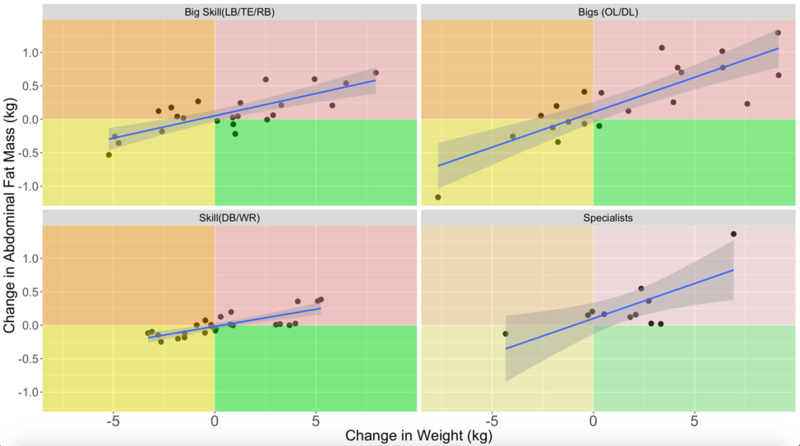 Figure 4 shows the relationship between change in weight and change in abdominal fat storage in football players measured before and after a competitive season. Understanding these relationships can improve both athlete health and performance as increases in abdominal fat have been associated with increased injury risk and decreased performance. Raymond et al. Association of Compartmental Leg Lean Mass Measured by Dual X-Ray Absorptiometry With Force Production. JSCR 2017. About the Author: Tyler Bosch, PhD is a Research Scientist in the College of Education and Human Development at the University of Minnesota, and is a co-founder of Dexalytics.